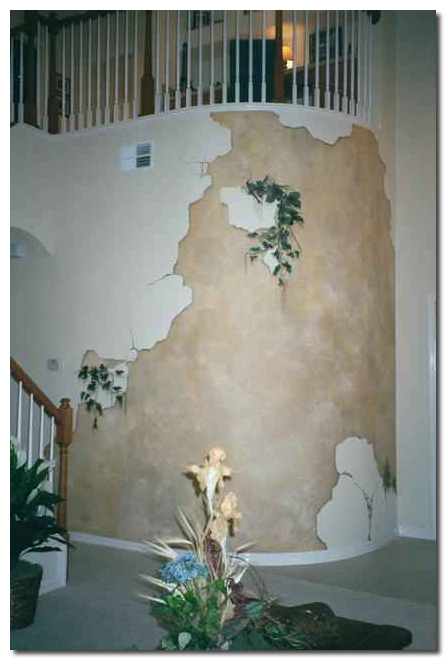 Some of our most popular Art Effects are our trompe l'oeil Rips and Tears. These are techniques we use to put our artwork in a box or frame. 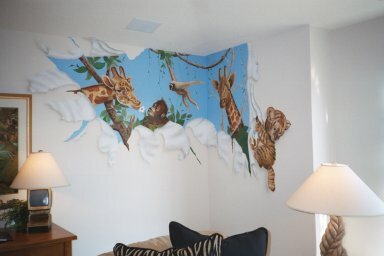 By creating a trompe l'oeil effect and adding an illusion to our art, we can give you a mural with more than you ever expected. 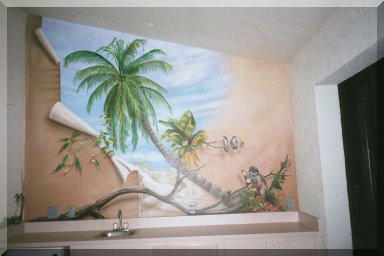 See how the above effect allowed us to keep the main artwork of the mural on one side of the wall. 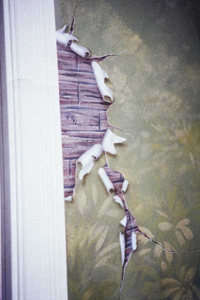 We applied a simple wash and created the rip and torn effect to half the wall and only painted the detail of the monkeys on one side. Notice that like a lot of our murals we have part of the artwork coming out of the effect, with the monkey's hand on an extra added trompe l'oeil effect, the bamboo wall accessory. Can you be tricked by our trompe? Come visit our store on CafePress! A store for artist by artists. A store for your artist' gear and gifts! 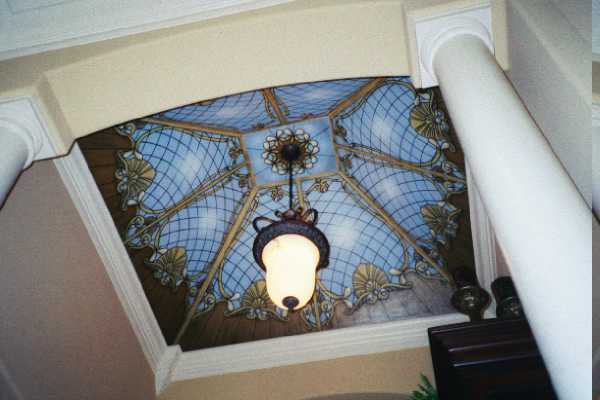 Here we have an example of how we incorporated a small vignette with a torn effect. 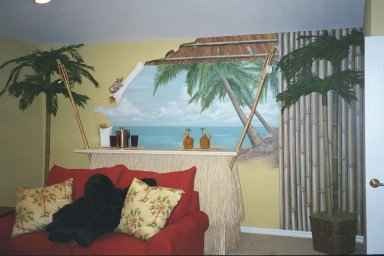 A simple tropical scene looking out a tiki hut, with an added trompe l'oeil bamboo wall in the far corner. 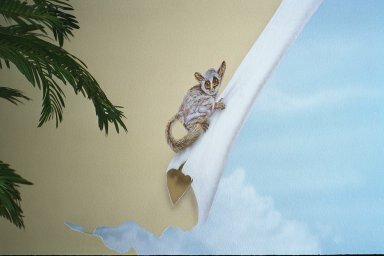 We added the little bushbaby hanging onto the folded back wall, for that little extra Art Effect. He's so cute, you gotta see him up close. "Art Effects... Putting The Trick, In The Trompe Of Trompe L'Oeil"
Do you get the idea we like painting monkeys ...face it they can go anywhere. This little mural is painted in the bar area around a pool. 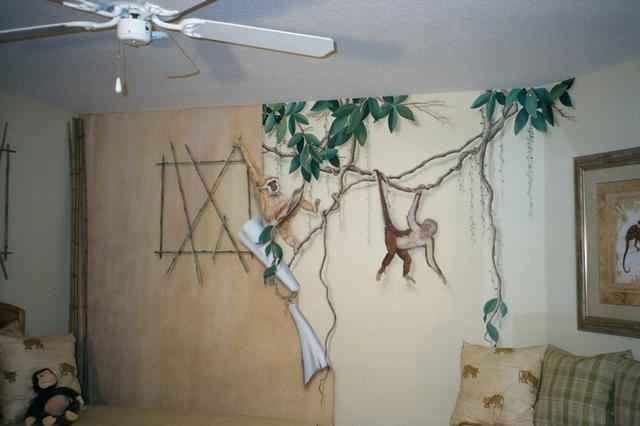 Once again we added the tree limb coming out of the mural and into the room. 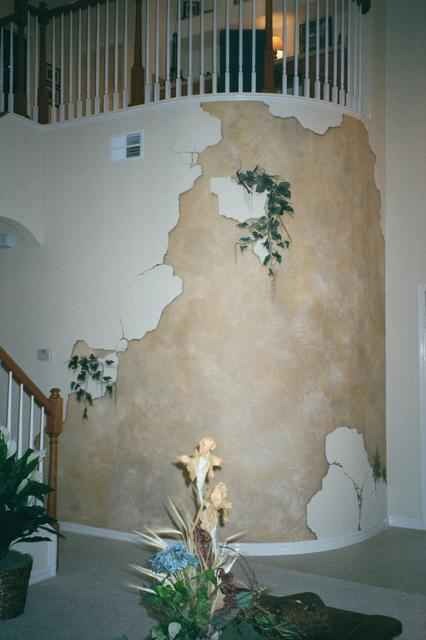 We recommend one of these torn effects in most children's rooms. By placing your artwork up and out of the way, inside a frame or a box, you open the rest of the room up for furniture placement, shelves and other art. "Can you tell where the Faux ends and the Real begins?" Learn How to Break a Wall!
" He who works with his hands is a laborer. He who works with his hands, and his head is a craftsman. He who works with his hands, and his head, and his heart, is An Artist. " the light sources in the room. to be life size or at least sized right according to the perspective. wall art with trompe l'oeil. and other examples of trompe l'oeil art that fools or tricks the eye. Can you be Tricked with our Trompe L'Oeil?? ?